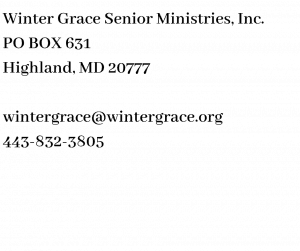 Why Winter Grace Senior Ministries? Fall prevention? Oh, I wish we had done more for my mom in this department. In June of 2008 my mother fell. She was 77 years old. She had had a number of health challenges, but she had overcome them. My mother was and is resilient, dete rmined, and, dare I say, tough. But then she took one misstep returning to her condo in the CCRC (Continuing Care Retirement Community) where she and my dad lived, and the last 10 years of her life have pretty much revolved around the resulting injuries and series of complications that followed that one fall. Dad has since passed away and mom was making tremendous gains physically. Then on another June day, this time in 2013, she took another fall. Another busted knee with complication from blood thinners and she has been in a wheel chair with 24 hours care since. 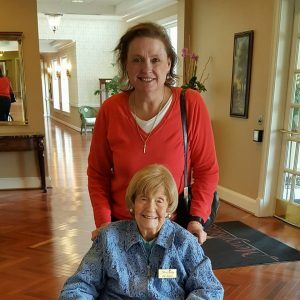 You see why I am passionate about fall prevention from this very personal connection to someone I love so much. 1 in 4 Americans over 65 fall each year. Emergency rooms treat and older adult every 11 seconds as a result of a fall. Every 19 minutes, an older adult dies from a fall. Falls are the leading cause of fatal injury and the most common cause of nonfatal trauma-related hospital admissions among older adults. In 2015, the total cost of fall injuries was $50 billion. Medicare and Medicaid shouldered 75% of these costs. These are pretty grim statistics, aren’t they? Sure, you may think that only other people fall, or if you limit your activity, or you stay home you will not fall. Unfortunately these myths are not going to keep you safe. The good news, and there is some, is that many falls can be prevented. Prevention doesn’t have to be complicated. It may just take a small bit of extra effort. Of course, falls are going to happen, but we owe it ourselves and our loved ones to do what we can to prevent these life altering. and sometimes life ending, accidents. Let’s dive in and see what we all can do to make our daily steps safer. There are many factors that play a part in health as it relates to fall risks. Basically the can be broken down into two major categories: Vision, Medication Management, and Mobility. Let’s address vision first. Yearly eye exams are crucial, especially as we age. Changing eyesight, whether it is from cataracts, gluacoma, or macular degeneration need to be addressed sooner rather than later. 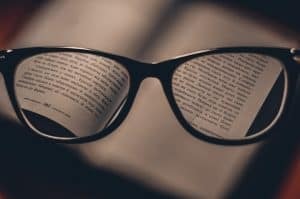 Any adjustments in prescription or even how you glasses are aligned can greatly impact the ability to move around safely. A decline in eyesight also causes apprehension and can lead to unsteadiness as well. Action Step #1: If you haven’t had an eye appointment in the past year or have noticed changes in your vision, make an appointment today. Your medications can play a part in your safety with regard to falls. Again, this article is in no way offering medical advice. What we would like for you to do is to make sure your primary physician or medical provider is aware of all of the medications you are taking. Often, as we go from specialist to specialist, some prescriptions or over-the counter medications may be left off of a list. If possible, have all of your prescription filled through one pharmacy. Always share any supplements you are taking with your physician and pharmacist. They are your first line defense for spotting potentially dangerous interactions. Action Step #2: Collect all of you prescription and over-the-counter medications and supplements into one place. Make a master list and share it with your primary care doctor and pharmacist. Ask them to review them with an eye toward dangerous interactions, especially any that could lead to falls. Strength, flexibility, and balance are the big three when it comes to fall prevention. Cardiovascular fitness is certainly important, but when it comes to falls we need to be strong and balanced. That flexibility can come in very hand to help us to adjust to conditions that become challenging out of the blue. Time spent with a personal trainer, especially one with a thorough knowledge of helping Older Adults, is a great way to help you gain the strength, flexibility, and balance that you need to stave off falls. Your community centers may have classes specifically devoted to just these goals. Exercising regularly with a trainer with the approval of your doctor can be one the most beneficial actions you can take to prevent falls. With improved strength and flexibility, you may also be able to lessen the impact should falls happen. You may be better able to catch yourself and decrease injury. 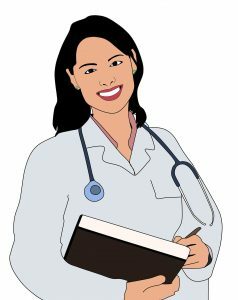 Action Step #3: See you doctor and look into a personal trainer or community center fitness classes. Make this a goal to accomplish this week. Excellent nutrition can help prevent muscle mass. It can also increase muscle mass too. Protein is essential for strong muscles. We have addressed many aspects of the importance of nutrition for vibrant health as we age. 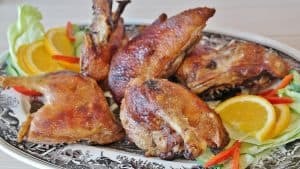 Please check out these articles on nutrition myths. Nutrition Myths Part 1 and Nutrition Myths Part 2 . Action Step #4: Review your food selections. Are they inline with the recommendations for excellent health? Keep a journal of what you eat over the course of a few days. Are you taking in the protein recommended? That is just the first step. Both past injuries and chronic conditions can both result in mobility issues. While some of these may seem insurmountable, we encourage you to seek your doctor’s recommendations as well as organizations that are experts with what your are dealing with. These organizations may have tools and programs designed to strengthen and rehabilitate each particular ailment. It is possible that some conditions may begin to resolve a bit with following the guidelines of fitness and nutrition. Action Step #5: Think out of the box. Contact a support agency for your Chronic Condition. They are the experts. Seek their knowledge. 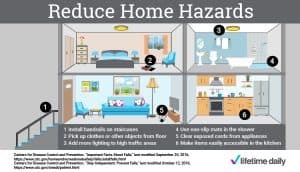 Fall prevention activity at home will be what helps you most. Just as a vast majority of car accidents happen within 25 miles of home, most falls take place in the home or just outside of it. There are several simple actions you can take to make your home a safer place to navigate. There are general problems house-wide to look for and fix. Then there are a few special extra fixes for specific rooms in your home. Our local fire department will come out to your home and do a safety survey at no charge to the home owner. They will take a tour of your home and make suggestions for how to make your home safer. If you are not excited by using the services offered from your taxes, you can do your own safety survey. 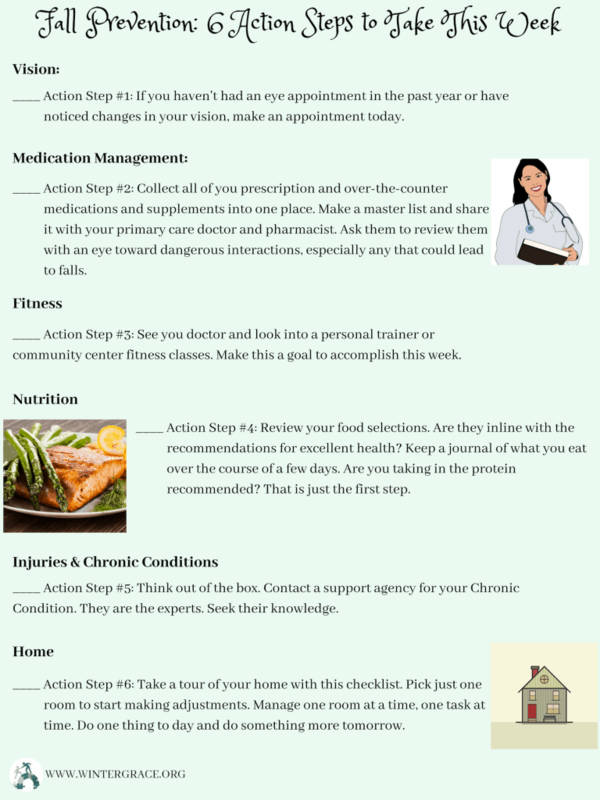 Action Step #6: Take a tour of your home with this checklist. Pick just one room to start making adjustments. Manage one room at a time, one task at time. Do one thing to day and do something more tomorrow. While none of us can fall-proof our lives, we can take simple steps to help prevent these potentially life changing events. Take these steps to make your steps safer. Please make fall prevention an important part of your to do list. Download and print out this Checklist. We are committed to bringing you the latest, most helpful information to Enrich and Empower Older Adults. When you subscribe you will receive the latest posts and updates on events. Be the first to see special announcements. We will never share your information with anyone. Please check our Privacy and Disclaimers Page for GDPR compliance.